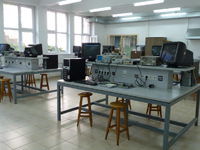 Teaching Laboratories | Boğaziçi University Electrical & Electronics Engineering Dept. The telecommunication laboratory provides the students with a hands-on experience on several aspects of analog and digital communications. In addition to hosting applied research opportunities for graduate students, the laboratory also serves the undergraduate- and graduate-level courses: EE 479 Telecommunications Laboratory and EE 562 Microwaves. The screened room (Faraday's Cage) located within the laboratory blocks out external electric fields and allows the researchers to accurately design and test communications transmitters and receivers. Current research conducted in this section of the lab includes the design of robust ultra-wideband (UWB) communications transceivers. The telecommunications experiment sets along with the basic measuring instruments and spectrum analyzers serve the EE 479 Telecommunications Laboratory course. The students conduct hardware experiments on several aspects of telecommunications covering a broad spectrum starting from basic analog-to-digital conversion to advanced digital modulation schemes. Additionally, several personal computers with LabView software installed are provided in the lab to allow students design and verify software experiments. The microwave experiment sets, microwave signal generators, and associated measuring instruments allow the students of the graduate-level course EE 562 Microwaves to design and experiment with several aspects of microwave transmission lines. Related Classes: EE140 (Digital Systems), EE208 (Basic Circuit Design and Measurement), EE598 (Advanced Digital Design) Equipments: 17 Bread Board/Full Kits (SC-2075 prototyping Signal Accessory Box with Output Cables), 15 Data Acquisition Toolboxes (NI PCI 6221(M Series) Multifunction I/O&NI-DAQ), 2 Data Acquisition Toolboxes (NI PCI 6052E Multifunction I/O&NI-DAQ), 17 FPGA Boards (Xess XSA-200), 17 Extender Boards for FPGAs (Xess XST-3) Analog and Digital multimeters, Oscilloscopes, Signal generators, True RMS Voltmeters, Vacuum Tube Voltmeters PCB manufacturing equipments: Ultra Vitalux UV Lamp,oven, chemicals, PCB cutter, a mechanic drill. 16 Personal Computers Purpose: Electrical Measurement and Networks Laboratory is designed to provide the student with the knowledge to use basic measuring instruments and techniques with proficiency. These techniques are designed to complement the concepts introduced in classes. In addition, the student should learn how to effectively record experimental results and present these results in a written report. More explicitly, the Laboratory objectives are:1. To gain proficiency in the use of common measuring instruments;2. To enhance understanding of electric circuit analysis concepts._ Inductance, Capacitance, and reactance_ AC and DC voltages and currents. Phasors_ AC power (real and reactive, instantaneous and average)_ Series and parallel resonant circuit behavior_ Rectifier Circuits_ Transfer functions_ Statistical Sampling3. To draw schematic diagrams and simulate simple analog circuits using SPICE and manufacture printed circuit boards. 4. To build digital circuits and use National Instruments’ data acquisition toolboxes and LabView software to apply digital signals and acquire digital outputs. 5. To implement their very large scale digital systems which were designed using a higher level hardware description language (VHDL).6. To develop communication skills through maintenance of succinct but complete laboratory notebooks as permanent, written descriptions of procedures, results, and analyses,7. To compare theoretical predictions with experimental results and to resolve any apparentdifferences. 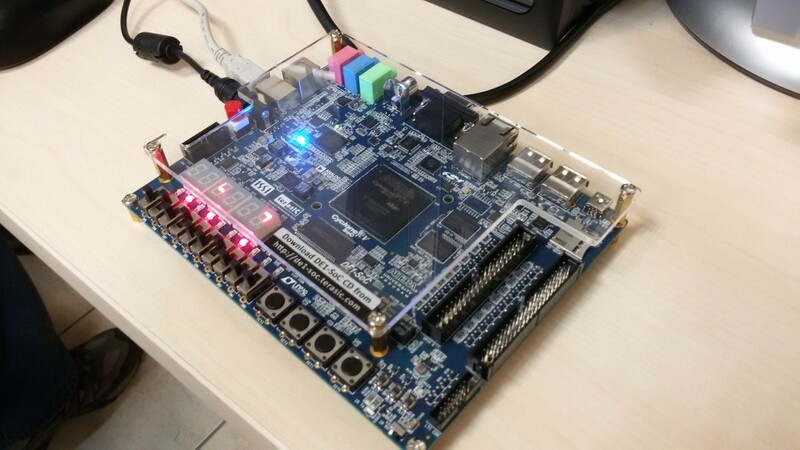 Related Classes: EE443 (Microprocessors) Equipments: 20 evaluation boards of DE1-SoC donated by Altera University Program, used to experiment with 32-bit microprocessors of Arm Cortex A9. These boards have Altera’s Cyclone V system-on-chip (SoC). It is manufactured using 28 nm technology. One part of it is FPGA, which can be used to form peripherals or interfaces and the other part is hard-wired Hard Processors System (HPS), which features the ARM microprocessors. 5-10 Personal Computers (Intel Core i5-4590, 3.3 GHz, 6 MByte smart cache, 8 GByte RAM, 120 Gbyte SSD Disc, 400 Gbyte Sata Hard Disc, Flat LCD Displays) installed with 64-bit Windows 7 Professional, Altera’s Monitor Program and Altera’s Quartus II. 8 oscilloscopes (Hameg, HM203, 20 MHz), used to measure pulse width, frequency and period in experiments related to the usage of the timer modules of SoCs. 10 PS/2 keyboards, used in experiments teaching how to communicate with SoC through PS/2 interface. Purpose: Students use this laboratory to gain experience on registers, addressing modes, instruction sets, memory structure, interrupts, serial communication interface (SPI and I2C), analog to digital conversion unit, and timing unit of system-on-chips (SoC) or microcontrollers. Studied microprocessor is ARM Cortex A9, a 32-bit microprocessor. The SoC is Altera’s Cyclone V. Software such as Altera’s Monitor Prgoram and Altera’s Quartus II running on the PCs in the laboratory, are used to write Assembly and C codes intended for this SoC. Experiments are done using evaluation boards of these SoCs. Related Classes: EE335 (Electronics Lab-I), EE336 (Electronics Lab-II) and EE439 (Electronics Lab-III) Equipments: * 12 Tektronix TDS-2002B 60 MHz Digital Storage Oscilloscope. * 15 Hameg HM-8030-6 15 MHz Function Generator * 15 Hameg HM-8012 Multimeter * 13 Hamge HM-7042/3 32V, 0.5A DC power supply * 12 Hameg HM-203-7 20 MHz Analog oscilloscope * Electronic test benches and bread boards Purpose: Electronics laboratory is the undergraduate laboratory where the juniors perform basic electronic experiments in the scope of EE 335 and EE 336 courses and the seniors find opportunity to work with more specialized circuits as part of EE 439 course. It is equipped properly according to a schedule that extends from acquiring knowledge and skills about practical working principles of passive and active components and developing the ability to use measuring instruments and techniques effectively, towards learning selected integrated circuits and basic electronic circuit building blocks and having the opportunity to experience specialized electronic circuits designed for particular jobs. All the equipment has been renewed and the students are provided with the means to work both with conventional analog devices and with more contemporary digital instruments. Particularly for the students who select the electronics option in the fourth year, this is a laboratory that gives opportunity to work individually, with the desired equipment, and without time constraint; thereby providing a free environment in the direction of the will and interest of the student. Besides the laboratory courses mentioned above, it merrily hosts the circuit design and implementation experiments performed as part of term homeworks (e.g. in EE 437 and EE 438), graduation projects (EE 491, EE 492) and graduate studies. In a separate room within the laboratory, tools such as PCB cutter, mechanic drill, etc. are also available, which provides the necessary means for those who want to produce his/her own PCB board and finalize his/her design including boxing. Its door is open any time within working hours to every student who wants to experiment more. In order to prepare our students for the professional life, whether academic or industrial, we cooperate with them by providing a positive communication. Related Classes: EE450 (Control Technology and Design)Equipments: 10 Personal Computers (Aidata, Dell, IBM)5 The DIGIAC 1750 Training Set 9 Feedback Analogue Units 33-1109 Feedback Mechanical Unit 33-1009 Feedback Digital Units 33-12017 Oscilloscopes (GW Instek, Hameg, Gould, Tektronix)9 Multimeters (Brymen)21 Power Supply (Feedback)1 Variable Phase Function Generator (TWG500) 2 Micamaster Microprocessor Application Trainer1 Microcomputer Training System (Siemens) 1 Stepping Motor (Schrittmotor) Purpose: The Control Systems Laboratory sessions comprise of four different experiment sets which cover the basic topics discussed in the lectures. These four experiment sets are prepared for the demonstration of the very basic measurement and feedback control concepts studied through the EE450 course. The DC motor set-up can also be used for creating other experiments with different control algorithms other than the ones listed below. A design project can also be assigned using available using the available experimental set-up.The first set of experiments deal with the input transducers and actuators such as slotted opto transducer, strain gauge, I.C. based temperature transducers which are the essential building blocks of the control of a number of physical systems. The second set of experiments is an extension of the first set and deals with output transducers such as a DC solenoid, a permanent magnet DC motor.In the third and fourth sets, a permanent magnet DC motor is used to introduce servo feedback control. First an analog experimental set up is used and the general characteristics of the DC motor are studied. The influence of the feedback gain and velocity feedback is shown on the position control of the DC motor. Then a digital control set up which includes an interface (with A/D and D/A converters) with a PC is used. First, position control and speed control experiments are repeated with control algorithms driven by the PC and position and velocity measurements supplied by a digital encoder. Following these experiments, the Proportional, Derivative and Integral (PID) control concepts are introduced and tested for position control using the digital control set up.